The scene is a late-spring afternoon in the Amazonis Planitia region of northern Mars. The view covers an area about 644 m (four-tenths of a mile) across. North is toward the top. The length of the dusty whirlwind's shadow indicates that the dust plume reaches more than 800 m (half a mile) in height. The plume is about 30 m (30 yards) in diameter. 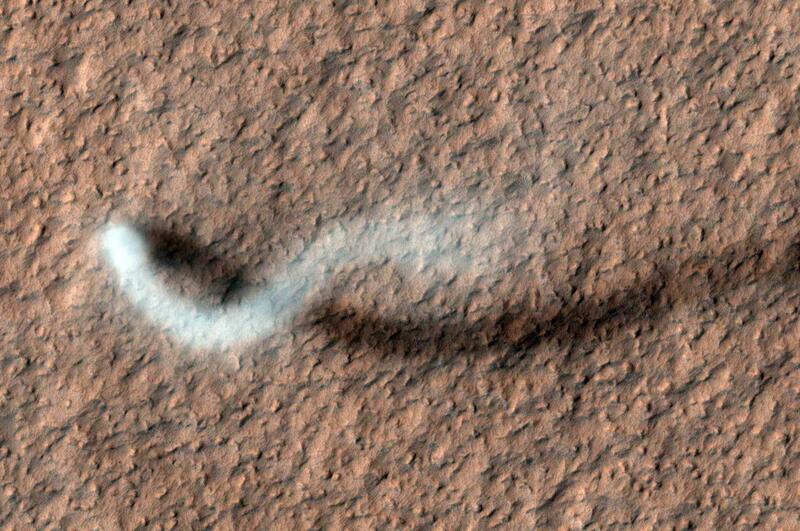 A westerly breeze partway up the height of the dust devil produced a delicate arc in the plume. The image was taken during the time of Martian year when the planet is farthest from the Sun. Just as on Earth, winds on Mars are powered by solar heating. Exposure to the Sun's rays declines during this season, yet even now, dust devils act relentlessly to clean the surface of freshly deposited dust, a little at a time. This view is one product from an observation made by HiRISE on 16 February 2012, at 35.8 degrees north latitude, 207 degrees east longitude. The image was originally published here.